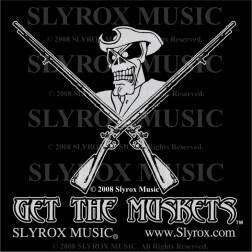 "Get The Muskets" is a symbol for a state of mind meant to act as a catalyst to uncover a greater sense of Patriotism to all Americans that lies within everyone. "Get The Muskets" was created at the side of similar implications and to have the same significance as "Nemo Me Impune Lacesset" (No One Provokes Me With Impunity), "Don't Tread on Me", "The Boston Tea Party", "No Taxation Without Representation", and even as far similarities as the movie "Red Dawn"...showing what it takes to band together and stand for something fighting against all odds. And doing what one believes-in when the overall collective has become unprepared and complacent. "Get The Muskets" is meant to reflect and bring back the values of what true Americans stand for...life, liberty, and the American Way. "Get The Muskets" is not meant to be a pro-gun message by any means. If one has learned, understands, and knows the United States Constitution, then they will realize and do not need to comprehend where it should assimilate. "I recollected that her eye excelled in brightness, that of any other animal, and that she has no eyelids. She may therefore be esteemed an emblem of vigilance. She never begins an attack, nor, when once engaged, ever surrenders: She is therefore an emblem of magnanimity and true courage. As if anxious to prevent all pretensions of quarreling with her, the weapons with which nature has furnished her, she conceals in the roof of her mouth, so that, to those who are unacquainted with her, she appears to be a most defenseless animal; and even when those weapons are shown and extended for her defense, they appear weak and contemptible; but their wounds however small, are decisive and fatal: Conscious of this, she never wounds till she has generously given notice, even to her enemy, and cautioned him against the danger of treading on her. Was I wrong, Sir, in thinking this a strong picture of the temper and conduct of America?" " Get The Muskets " is a sign for those who have protected our freedoms and for those who continue to do so now...while standing up for justice and standing up for truth. Get Your T-Shirts and Stickers Today!